Giant inflatable rabbits were one of many installations on the Lawn on D.
FOR THE PAST two years, the Lawn on D has been an enlivening feature in an otherwise featureless part of town adjacent to the Boston Convention and Exhibition Center. Amid the service roads and maintenance facilities of the transitioning industrial district, the 2.7-acre “experimental event space” has injected whimsy and creativity into a city known more for sober historic homage. 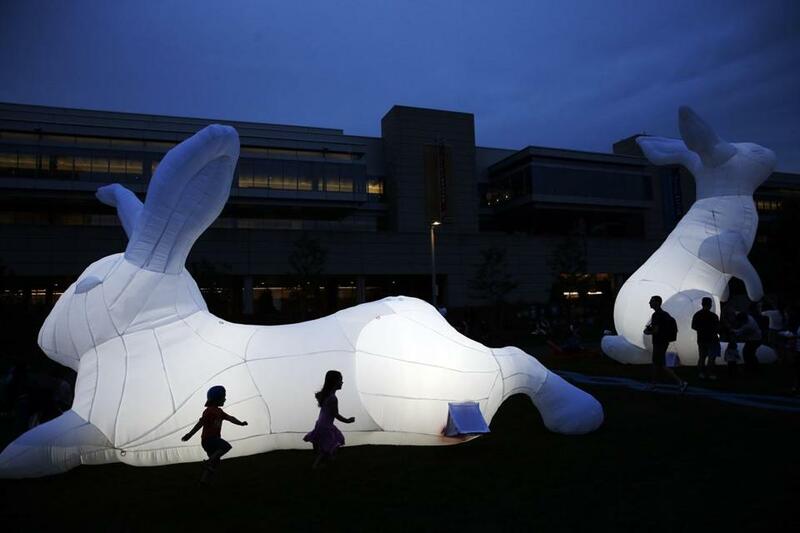 Giant inflatable bunnies, glowing O swings, and pop-up art installations draw overflow crowds, delighting conventioneers, visitors, and residents who are starting to colonize the emerging neighborhood. Now the project is facing significant cost overruns, and it has barely eked out another year of operation by the Massachusetts Convention Center Authority. The award-winning project’s off-again, on-again future illustrates the limits of privately run public spaces. But it also suggests a role for institutions like the MCCA in urban place-making that shouldn’t be sacrificed simply to turn a profit. At almost $1 million per acre, the Lawn on D’s programming and maintenance expenses are certainly ambitious, but it was an investment the convention center was willing to make, at least initially, to help forge an identity for the area and establish the looming quasi-public authority as a good neighbor. Still, it was meant to be an ad hoc, temporary space, eventually absorbed by the convention center’s expansion, and public access shifted to some other open space. No one warned us not to fall in love with it. Somewhat akin to the Rose Kennedy Greenway or Bryant Park in New York City, the Lawn on D occupies a hazy realm between public space and private ownership. It looks and acts like a park, but it’s as much an amenity for the paying customers at the convention center as it is a hangout for the local coffee klatch. The lounge chairs, games, and Wi-Fi are mostly free and open to the public, but the park closes at 10 p.m., and some events are ticketed. Johanna Storella, MCCA’s chief strategy officer and a big reason for the project’s success, walks a fine line when she says “we want a financially self-sufficient space” but also a acknowledges “a longstanding community obligation” to provide a well-maintained, engaging open space for public use. Given its wide popularity, and with the convention center’s expansion on hold, the Lawn on D should be knit more tightly into the city’s fabric. But the proposed remedies for its $2 million shortfall will require more of the area to be roped off for private parties, at projected fees in the thousands. The authority is even weighing whether to build a private rental section on the lawn with seating for 200 people. Many will find this an acceptable concession to keep the Lawn on D running. But the authority needs to calibrate the tipping point after which the space ceases to be a public amenity at all. In getting the Lawn on D to pay for itself, will its operators discard what makes it great? Granted, the MCCA is not wholly responsible to the public, as a city parks department would be. It is more like the Massachusetts Port Authority, operators of Logan Airport, with a mission primarily to stimulate economic development. Still, Massport offers a good model in its decision to build and operate Piers Park on land it owned in East Boston, which has transformed that area from an industrial drossscape into a place of neighborhood pride. The convention center authority made a commitment to Boston to maintain an attractive, open civic space while stimulating the region’s economy. It’s up to the MCCA and its newly constituted board to make sure those two purposes are not at cross purposes.